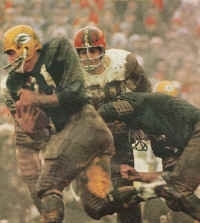 It had been three years since the Green Bay Packers had last won a NFL title as they faced the defending-champion Cleveland Browns in the league Championship game on January 2, 1966. Head Coach Vince Lombardi’s team was a blend of solid veterans who had been a part of title-winning teams in 1961 and ’62 and rising young players. They had battled the Colts to a tie atop the Western Conference with 10-3-1 records that necessitated a playoff that Green Bay won in overtime. 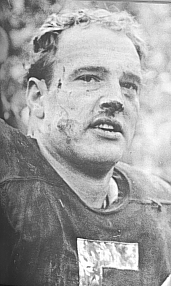 However, a cause for concern was that many of the team’s veterans were hampered by injuries, including QB Bart Starr, HB Paul Hornung, and FB Jim Taylor (pictured at right). The Browns, coached by Blanton Collier, had won a stunning shutout victory over Baltimore in the previous year’s title game and again topped the Eastern Conference at 11-3. They were without split end Paul Warfield, one of the stars of the ’64 team as a rookie, for most of the season due to injury but still had the incomparable FB Jim Brown, who won his eighth league rushing title with 1544 yards and scored 21 touchdowns. QB Frank Ryan and flanker Gary Collins were also keys to the offense. Snow arrived in the morning, but it had changed to freezing drizzle by game time. There were 50,852 fans present at wet and muddy Lambeau Field. The Packers took the opening kickoff and drove 77 yards in seven plays that culminated in Starr passing to flanker Carroll Dale for a 47-yard touchdown. The Browns came right back by going 66 yards in just three plays. Ryan threw to Jim Brown for a 30-yard gain, connected with Paul Warfield for 19, and then passed to flanker Gary Collins for a 17-yard touchdown. However, the extra point attempt failed due to a bad snap from center that had PK Lou Groza trying to pass to his holder rather than kick and the Packers maintained a one-point lead. 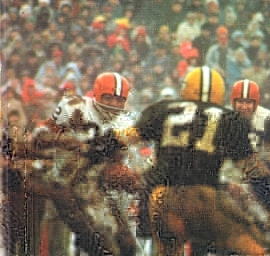 Late in the first quarter, and following a Green Bay punt from its own end zone, Lou Groza kicked a 24-yard field goal to put the Browns in front by 9-7. The Packers responded by driving to a score. Paul Hornung ran for a 34-yard gain to the Cleveland 39. Following a Starr pass to split end Boyd Dowler for 11 yards, the combination of Taylor and Hornung advanced the ball to the three. The Browns held but Don Chandler kicked a 15-yard field goal early in the second quarter and Green Bay was back in front. Chandler’s second field goal was set up by an interception by FS Willie Wood, who returned it 15 yards to the Cleveland 10. However, a motion penalty set the Packers back and Starr threw three incomplete passes. Chandler was again successful with a three-point try from 23 yards out that made it 13-9. With less than three minutes remaining in the first half, the Browns punted and the 50-yard kick by Collins went out at the Green Bay four. Advancing to the 11, a third down pass by Starr was picked off by CB Walter Beach at the 30. Ryan immediately tried to go for the touchdown, throwing a pass into the end zone that was intended for Collins but it was broken up by SS Tom Brown and CB Bob Jeter. The series ended with Groza kicking a 28-yard field goal with 48 seconds remaining on the clock. The Packers carried a slender lead of 13-12 into halftime. A light snow was falling as the game moved into the third quarter. The Packers put together an 11-play, 90-yard drive in the third quarter that was highlighted by Hornung gaining 20 yards on one run and scoring on a power sweep from 13 yards out. The series consumed nearly seven minutes. WR Walter Roberts returned the ensuing kickoff 33 yards. Ryan scrambled for eight yards and a facemask penalty added another 15 to advance the ball into Green Bay territory. The drive finally stalled at the 28. Cleveland came up short when Groza’s 37-yard field goal attempt in the third quarter was partially blocked by DT Henry Jordan and was unsuccessful. The Packers put together another long drive, going from their 20 to the Cleveland 21 with only two passes along the way as Taylor and Hornung again ran effectively. Chandler kicked a 29-yard field goal with 9:28 remaining in the game. Cleveland again was forced to punt but it was another good one by Collins and pinned the Packers down at their seven. Starr was nearly tackled for a safety by DE Bill Glass but managed to get out to the two before being brought down. Following a five-yard carry by Taylor, Chandler punted from his end zone but any advantage for the Browns was nullified when TE Ralph Smith barreled into the kicker and drew a roughing penalty. The Packers didn’t score again but also didn’t relinquish the ball until there were only about two minutes remaining. The Browns only reached Green Bay territory one more time during the second half, and after making it to the 47 Ryan was sacked by DE Willie Davis to push them back to their 48. A last-gasp long pass intended for Collins was intercepted by CB Herb Adderley, who made a leaping grab to extinguish the threat and nail down the 23-12 win for Green Bay. The Packers significantly outgained Cleveland (332 yards to 161), ran 69 plays to Cleveland’s 39, and also dominated in first downs (21 to 8). They had a huge edge in rushing yardage (204 to 64) and also turned the ball over only once, to two by the Browns. Green Bay’s defense took control and completely shut the defending champs down in the second half. Paul Hornung (pictured at left) gained 105 yards on 18 carries that included a touchdown and workhorse Jim Taylor added 96 yards on 27 attempts and added 20 more yards on two pass receptions. Bart Starr completed 10 of 18 passes for 147 yards with a TD and an interception. Boyd Dowler caught 5 passes for 59 yards and, with the long early scoring reception, Carroll Dale gained 60 yards on his two catches. For the Browns, Jim Brown was held to 50 yards on 12 carries and led the club with 44 yards on three receptions out of the backfield. Frank Ryan was successful on just 8 of 18 throws for 115 yards and a TD with two picked off. Gary Collins, like Brown, caught three passes, for 41 yards and a score. While the win over the Browns was the first of three straight NFL titles for Green Bay, it also was something of a last hurrah for the backfield combination of Jim Taylor and Paul Hornung, who had played such a major role in the team’s rise but were showing signs of wear by 1965. Both were back in ‘66, but at reduced effectiveness. Taylor rushed for 705 yards while averaging 3.5 yards per carry. Hornung ran the ball only 76 times for 200 yards in an injury-plagued year. They were gone by the time the team won its third title in ’67. While no one knew it at the time, the 1965 title game was also the end of the line for Jim Brown (pictured below) in a Cleveland uniform (he played once more in the Pro Bowl). The great fullback announced his retirement during the summer of ’66 while on movie location in London. He left as the all-time leading rusher in NFL history with 12,312 yards, a record that lasted until 1984, while leading the league eight times in nine seasons and averaging 104.3 yards per game and 5.2 per carry. His record of 126 touchdowns scored lasted until 1994.